As an industry, we work hard to keep our residents happy. We turn work orders around quickly, we host resident events, we are always on the look-out for ways to make the lives of our residents easier, and so much more. All of these are things that our residents expect from us. But sometimes, what is not expected can make a bigger impact on how our customers view us. Think about a time when somebody did something for you that you weren’t anticipating. How did that make you feel? Now imagine doing something that makes your residents experience a similar emotion, and how powerful that could be. The lasting effects will also be powerful as your residents become bigger advocates of your community and will express that in many different, beneficial ways. The key is to recognize an upcoming “event” of some type and to find a way to leverage it without prior announcement to your residents. This may be a holiday of some sort, or it may be something that might be viewed as negative which you may find a way to turn into a positive experience. You don’t necessarily have to spend a lot of money or time, just get creative and have some fun with it; when your staff truly buys into the event ideas, your residents will too! In January of 2016, in the Washington, DC Metro Area, we were hit with a blizzard; the largest since 2010, delivering up to 3’ of snow. A big snow in this region typically results in grumpy people who know they are going to get stuck at home for anywhere from a few days to up to a week or more depending on where they live. At the time, I was working with an upscale lease up in Reston, VA. We had all of the “musts” in place (snow clearance plan, staff members staying onsite to take care of residents, cleaners staying onsite, etc) but decided to do more since we knew that our active residents would get cabin fever (somehow this develops in a very short period of time when people are “forced” to stay home). So, we developed a plan that we did not announce in advance. The planning was easy. We already had hot cocoa in our resident coffee machines so we ran out and purchased marshmallows, sprinkles, whipped cream and a few other toppings. We already had popcorn, checked the TV listings to choose which movies we’d show on the multiple televisions in our media center, and headed to Target to buy some board games (which would come in handy in the future as well). We already had gift cards on hand that we could use as prizes, so the only thing we had to do for the snow related contest was to launch it. Announced the winners and awarded the prizes on Monday Part way into the day on Saturday, we launched phase two by announcing that we had hot cocoa and toppings ready to go, popcorn popping, games to play and movies running on the televisions. Many of the residents took part in some or all of the activities and had a blast. 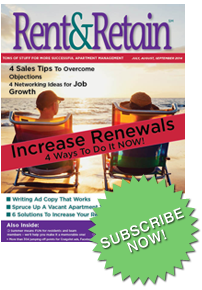 The retention benefits are obvious- happy residents stay. There were also marketing related benefits. The snow contest took place on social media and we saw a tremendous amount of engagement on our pages as a result. Residents post “thank you” notes to our Facebook page for the great service they received during the storm (this wasn’t all relative to the surprises as our onsite team did a great job in taking care of our residents’ needs as well; including having the maintenance team shovel out all of the cars in the surface parking lot- another surprise). During a time when we would have expected to encounter some unhappy residents, all we heard was the sound of people having a great time. We planned it in advanced, but to the community, it all was a pleasant surprise. Have chair massages available for residents as they come home from work on a day where traffic in your area is worse than normal. These are just a few ways that you can delight your residents when they least expect it. 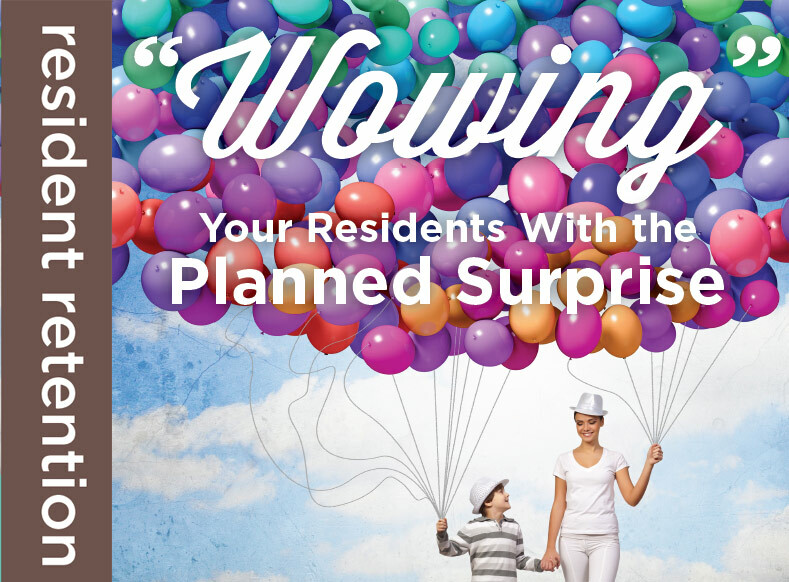 Put your thinking cap on and I’m sure that you can find many more ways to “wow” your residents with a planned surprise! Vice President of Marketing for Community Realty Company, Karen Kossow currently oversees marketing for Community Realty Company, Inc. in the Washington, DC market. In this role she is working to modernize the company and to position it to grow through acquisition, development and third party management. 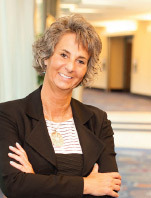 In addition to being responsible for implementing new marketing programs, Karen has implemented an online training program, and is in the midst of overseeing the process of selecting and implementing new property management software. Karen is one of the best and brightest in our business and has been a friend of Rent & Retain since it's inception.